While it's helpful to denote how much of each colour exists, it is not a very friendly system to describe a hue shift, saturation, or value/brightness). Try looking at a colour and try to arbitrarily dictate how much of each primary colour composes it. Not so easy right? Now that's a lot easier to describe colour with. Want a colour to be more turquoise? Scarlet? Plum? Just shift the hue slider until it hits the sweet spot. Need brightening without losing saturation? It does that too! With colours having different natural brightnesses to each other, preserving luminosity when tinting with hue shifts poses a problem with contrast. When adjusting a saturation value in HSV, the value scale adjusts proportionately to maintain the same amount of brightness. Yellow has a higher natural brightness than purple which sits on the opposite end of the colour spectrum (which is easily observed when looking at it in grey scale). What does this mean? It means that simply lightening or hue shifts destroy levels of saturation when controlling all channels. This is because the natural luminosity of red, green and blue at equal saturations differ significantly. To compensate the desaturation, the value/brightness needs to be scaled in HSV to match. It is important to maintain a strong contrast in brightnesses, so attention to natural brightness is helpful in picking appealing colour schemes and palettes. While amounts in HSV are not completely relevant for telling a display how much within each RGB channel is required, it creates a scale that describes useful properties of colour. 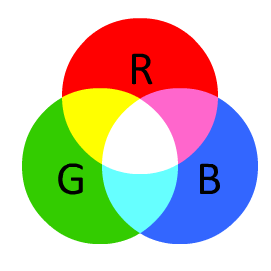 And at the end of the day, it's returned as RGB or hexadecimal; merely a different way to break down colour components into locations within a given colour gamut. Of course HSV doesn't scale to all digital colour spaces, but in most cases you should be able to flip over from the RGB scale. Being able to apply traditional approaches in picking and applying colour opens up a more fluid and natural work flow, which can assist the transition for traditional artists migrating into the digital realm. So HSV or RGB as a colour refining scale? Obviously HSV! Get into the habit of tweaking colour with the HSV sliders, and you will be able to control those all too often fidgety selectors and pickers in a breeze! If you have any questions, feel free to email me, send a tweet, or find me on the forums.